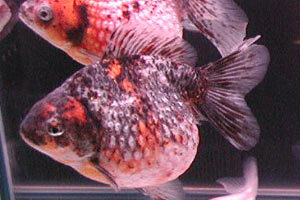 Note the fantail-type finnage and the good red colour in these fish; strong red colouration seems to be lacking in Western pearlscales which are usually orange-white. Notice also the extreme roundness of the bodies. 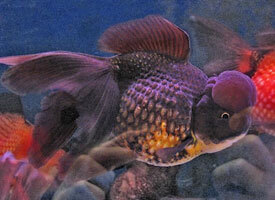 Black-white-red fish with fantail-style finnage. 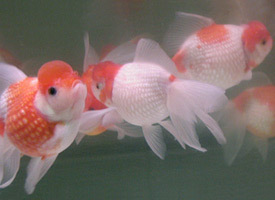 Further oranda pearlscales photographed in Hong Kong, 2010. 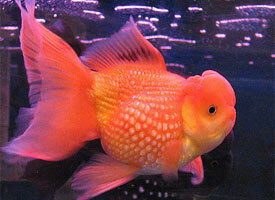 These fish have an oranda-style hood: a prominent growth on the top of the head (cranial region) giving the appearance of a hood, with less well developed growths on the cheeks and gills (infra-orbital and opercular regions). 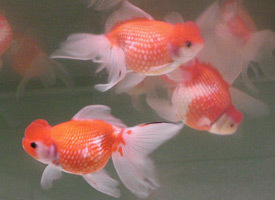 Note that the finnage is longer (as in the ryukin and the man-yu), being intermediate between the fantail and the veiltail. 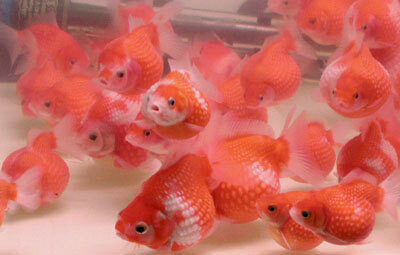 Called crown pearlscales in the USA. 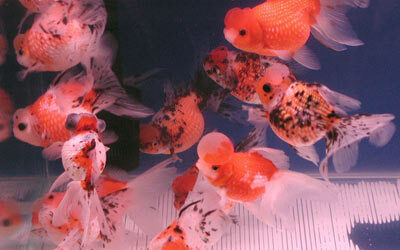 Oranda pearlscales of various colours with larger than usual, bubble-like hoods. 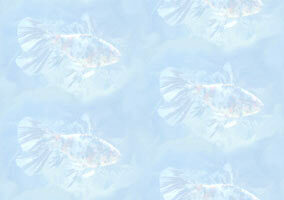 At bottom left is an oranda pearlscale dragon eye (an oranda pearlscale with globe eyes).